According to CBAT Transient Objects website we've got a bright nova in Centaurus (5.5 magnitude). I've programmed APASS to take a look at the field. However, at 13hrs, it will be another 7-8hrs before imaging occurs. I am going to observe it in an hour or so. The sequnce team will surely come up with a sequence later but for such bright stars the magnitudes are very good so there should be no problem. I could observe the new nova candidate at V= 5.3 (5.33) at 05.44 UT. It was very bright and looked yellowish to the eye, certainly not the same color of the white-bluish HD 118978 (V= 5.38). I used that one and HD 125158 (V= 5.22) as comparison stars. Let's see if this nova is on the rise or already reached its peak. Hi friends, I observe it too at 06:55 UT (Dec 03) and estimated at 5.4 magnitude using BSC stars (522 and 538 on Otero's Chart). 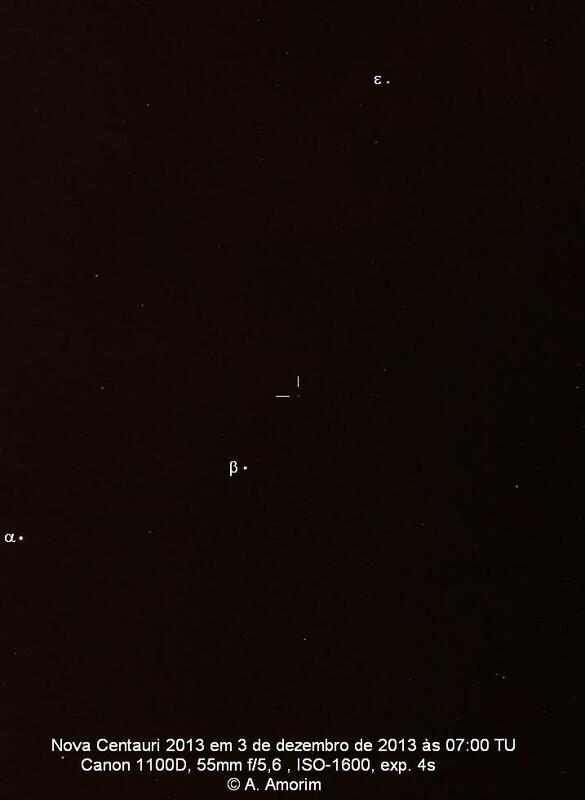 The star was observed through 10x50B and naked eye. I'm not experienced enough to place a good visual magnitude on it other than to say it looked on the bright end of 5th magnitude. The question is what stars to use for CCD observation. At this brightness, all nearby stars are fainter, so you will have to push the nova closer to saturation or stack multiple images to get good signal/noise in the comps. Here is a comparison of APASS images; 16x16arcmin, centered on the nova. One is from 2012 and the other is a closeup of the one from last night; both V band. You can see that there is a close companion to the northeast that will be a problem as the nova fades, but is not a factor now. its an easy naked eye object. The nova has brightened further to be mag 4.7 on Dec 3.743UT. I actually made a negative observation of it on Nov 27.8UT as it's directly between R Cen and V412 Cen and it must have been below 7th mag otherwise I would have noticed it. Andrew's post about the nova position falling between a couple of variables that he normally follows reminded me to look at BSM_South data. We have one variable nearby that has been imaged: ASAS_J135026-59448. It turns out that the nova position is right on the top edge of the images, so we have three nights of BV imaging that can be used to determine any prior outburst. These are 120508, 120515 and 130811. In addition, I've mentioned that there are a handful of nights from APASS. This is a pretty crowded field, fine for the current outburst, but be careful as the nova fades! Steven Graham in Templeton, NZ, has a webcam set up on his website http://www.skywatcher.net.nz. After hearing of this nova, he searched his archives and found it was visible on his image at 0945UT (Dec 2), but not on the previous dark one at 1330UT (Dec1). The cam is admittedly fairly low res, but I thought it was of interest. I'm going to ask him to post the two images on his site. Nova Cen 2013 as bright as Nova Del 2013 and possibly brighter! I made it at V= 4.3 at 06.37 UT. Going to bed 5 AM these nights is worth! I hope to have even better news tomorrow. I had my first glimpse of Nova Cen 2013 (PNV J13544700-5909080) at 5:14am local (Adelaide) time today, as the sky was starting to become blue. All I can really say from that hurried observation, given the finder chart (provided by Sebastian above; thanks) is that it was brighter than the magnitude 4.33 comp star (2456631.28102, >4.33). Outside about 45 mins earlier. Have another finder chart with brighter comp stars. Suggestions for VSP parameters welcome. VSP has a plotting limit (1200 arcminutes) that will let bright comp stars outside of the field of view. That's why we chose to suggest some additional comp stars in the Alert Notice. Last night I used eta Cru and the 43 and it was slightly brighter than the latter. I think it is near its peak, at least it doesn't seem to be rising fast now but I notice that, being so South, coverage is much poorer than that of Nova Del 2013. Of course! I should have checked the alert notice. Thanks Sebastian. I'll take note of those comp stars for my next observation. Yes, it's not an ideal observing time, especially when one has to work, but I'm going to make as many observations as I can, sky permitting, as I did with Nova Del 2013. This morning is the first time I've been able to see it. Re: peaking, it would be nice to see it brighten further, but I suppose we'll see. I've programmed APASS so that, starting tonight, it will take a short exposure series. At 4th magnitude, it is really difficult for APASS to use a short-enough exposure, so it may be a few nights before the nova has faded enough to be unsaturated. We also have BSM_South taking data on clear nights; we almost got data last night, but clouds rolled in at the end of the night when the observations were to be taken. However, there are a number of DSLR folk in the southern hemisphere - this is an ideal target! If you have one of the SSP-4 J&H photometers, your measures are really valued. Two bright novae in a single year - what fun! We ran out of comp stars again! It is now brighter than gam Mus (V= 3.85). I used delta Mus (V= 3.608; B-V= 1.180) to estimate it and got V= 3.80. They are all blue, the nova looks whitish but delta Mus is closer and high up in the sky. I can't wait to observe again tomorrow! Need even brighter comparison stars? Wow! If this keeps up, I'm wondering whether we are going to need something closer to magnitude 3.0 in about 6 hours when I'll next attempt to observe this. Right now it's all-sky cloud and rain here and the forecast for the morning looks dubious, but we'll see. Are any of the following suitable candidates for comparison stars? I'm primarily looking at magnitude, B-V, and whether there's any known variability (SIMBAD, VSX). Does the lambda Centauri nebulosity make this unsuitable? Unsuitable due to 3.38 magnitude companion? Obviously I'm being fairly optimistic about the peak magnitude here. This is a spectroscopic binary. To what extent does this or a multiple system in general preclude use as a comparison star? There is no problem with using those stars because they are very close binaries so you will always be seeing the combined brightness of the two. Specially when speaking of naked-eye estimates, the separations can be as large as 150" or so. Don't use SIMBAD values, they may come from Tycho for bright stars and are not recommended when we have the GCPD. Yes, everything is slightly variable here but not a problem for visual observations. I hope it gets clear at your site. According to IUAC #9265 this Nova was officially named as V1369 Centauri. Cloudy sky in Florianopolis at this Dec 5. Another observers in Brazil estimated today between 3.7 and 3.8 at naked eye. At V~3.7 the novae will probably be getting bright enough for obsevations in the NIR with the SSP-4. Has anyone thought about observing with one? I've contacted the folks at REM to ask for JHK photometry, but with the novae being so bright, they will probably saturate. That drive to Mauna Kea would be a bit much. At least I just have to step out into my backyard Mike. Thanks for the feedback and corrections re: comparison stars Sebastion. I caught brief, tantalising glimpses of V1369 Cen near dawn (around 5:05 am Adelaide time and for 20 minutes or so thereafter) through thinning cloud with 7x50 binoculars. The nova seemed brighter than yesterday morning but I cannot quantify that since I couldn't see more than one comparison star and the nova for long enough to be able to make an estimate. I briefly spotted bet Mus and the nova within a few seconds of each other and the nova was certainly less than beta Mus (<3.045). So, all I can declare is that it was brighter than my Dec 5 observation (which I said in an earlier post was >4.33) and less than 3.045. The forecast for tomorrow is less dismal, so I'll try again then. At the moment (dec 5) it looks like the continuum emission is due to the spherically expanding photosphere of the ejecta. But, there might be another component die to a jet-like thing expanding over the poles. If so, that would contribute most to the emission lines, and be Polarized, so observing in a narrow band filter with a polaroid in different rotational positions might give some important clues. If anybody is set up to do that, and now, when it is bright and before the transition to a nebular state, that would be giving some important clues. Let me know if you can/could do that, please. Nova Cen 2013 already fading? It looks like the nova is already past its peak. My observation is exactly the same as last night's. V= 3.8. Observers from other latitudes seem to have caught the peak earlier today around V= 3.7. Anyway, we need to keep observing to see what happens! I finally managed to get some photometry - by using the CCD though my 80mm guidescope, defocusing to avoid saturation. V 3.924, B 4.345 at 2013-12-06 17:07 UT JD 2456633.213796. I was clouded out this morning and the next few days don't look promising either. I'll try again tomorrow though. See my blog for more including a light curve. After cloud and wind, I was able to spot this lovely nova perched near beta Cen. I estimated it at V 4.1 +/- 0.2 this morning (2013 Dec 07 @02:33 UT). I did some more photometry this morning (7 Dec 17:40 UT) again through the guidescope stacking 12x1s subs. V=4.276, B=4.85. I'm more confident in these when I saw that my measurements yesterday were within 0.005 of Arne Henden's transformed B and V obs taken with BSM South. if my B measurement is correct, the B is fading faster than V.
i also took some lo-res spectra with the SA100. Ysterday's spectrum which showed a balanced P Cygni profile for the Hydrogen lines is gone. Now the Hydrogen emission lines are emerging again from the continuum. This would explain the B-V increase: the H alpha lines are staring to contribute more to the total flux. As mentioned by others, I've posted two nights of BVRI photometry from BSM_South of the nova. These are preliminary results, as I'm just using the two 7th magnitude comp stars in the field as a small ensemble, and those stars only have UBV measures (I'm using instrumental Rc/Ic magnitudes for those two stars, as determined by BSM). There isn't anything really bright nearby, so even in the final case, it will probably be a small ensemble of perhaps 3-4 stars. It was nice of Peter Nelson to work hard at leaving BSM_South running on those two nights! There was a third earlier night taken through heavy clouds, but I don't think anything will be salvageable from those images. Each night is actually a small time series; about 90minutes on the first and 120 minutes on the second. These measures will be stacked in the final analysis to improve the signal/noise. At 4th magnitude, I'm taking 1-2 second exposures, so most of the scatter is from scintillation at high airmass and small telescope aperture. V1369 Cen will be around for a long time, and is rising in the east, meaning that you will have many months of possible monitoring. I hope that people stay interested in this one! Perfect for DSLRs right now, and an easy target for spectroscopy. As I mentioned above, we have a set of images taken through cloud with BSM_South on 131204 UT. As this was during the rise to peak, the images have value. However, the clouds were pretty thick. I've gone through them and attempted to get some photometry, but it is taking way too long. If someone else wants to play with the data, and try different stacking methods to get out one B,V,R,I photometric dataset, I'll be happy to place the images on our ftp site or upload them to your VPHOT account. There are 93 images, each about 2MB in size compressed. Here's a trap I have found in making visual estimates of V1369 Cen. There is a 4.7 to the south of the nova and a 4.3 to the north. When the Pointers are very low in the sky (for me maybe within 10° from the horizon), the 4.7 appears brighter than the 4.3. I think it's called 'extinction' but if not, please can someone correct me. This creates MAJOR problems in estimating the brightness of the nova. If fact, for me personally, it is pointless to make an estimate until the nova gets higher in the sky (ie later at night). On 7 Dec, the spread in visual observations was 0.8 mag. On 9 Dec 0.7 mag. Is this spread due to fluctuations in the nova, or individual observer differences, or because the nova was close to the horizon for some observations and higher for others? After being faint last Sunday morning (V= 4.35), two days later it is back to V= 3.8. I estimated it V= 3.83 at 07.31 UT. I think it is showing ups and downs and we are missing it because of lack of coverage, because I see that sometimes I make it brighter or fainter than other observers some hours earlier or later. Will it be an important rebrightening or just an example of that variability? Yes, there is a hint of variability in the short BSM_South time series. These are taken at high airmass (starting at X=2.5), so I don't have strong confidence and would like it if we had additional digital observers (not all visual observers have Sebastian's eyes!). At mag 4, this is still too bright for APASS, so I won't have any Chilean time series for another week or two. We saw fluctuations near maximum with V339 Del, so this is not unusual. I'm hoping some of the DSLR observers will start posting their data! Regards to all the observers of this Nova! with the Nova so bright it is worth to recommend all visual observers to look for comparison stars at the same altitude of the Nova, i.e. on the same "almucantarat" (arabic name for altitude circle). Reliably they will be affected by the same airmass extinction. Real or artificial oscillations? I agree with the remarks of Arne that some of the visual observations may be suffer for atmospheric extinction, or airmass problems. For this reason I show an example of the airmass effect and I suggest to look for same altitude stars, even if they are rather far from the target star. With the Nova at 3 - 4 magnitude the unaided eye can work very well to do very good estimates, with stars more the 20 degrees apart. Example of airmass extinction: From Rio de Janeiro, praia Vermelha, because of the haze I have verified that Gamma TrA (3.2) altitude 15 degrees was at limiting visibility, as well as Epsilon Crucis (3.55) which was at 32 degrees. Therefore 0.75 magnitudes were lost on these 17 degrees of altitude from 32 down to 15. If the atmosoheric extinction would not be taken into account, there would be an error up to 0.75 magnitudes of the evaluation of the measurement. AAVSO charts do not help unaided eye observations because they are limited to a field 1200 arcmin, 20 degrees. They can be used afterwards for photometric references. With naked eye it is easy to find comparison stars of similar magnitude. After, at the computer, the program Stellarium (free) helps a lot, especially for them, like me, who are not used to observe the Southern Sky. With the program we can recognize the comparison stars, knowing their HIP number (Hipparcos Catalogue) and it magnitude. With HIP number it is worth to check also the site of SIMBAD http://simbad.u-strasbg.fr/ to verify the V magnitude and in other photometric channels. But this is a work that can be done also afterwards in the day. During the night it is important to draw the positions of the stars and to apply the usual comparison method to evaluate the magnitude. Results within 0.1 magnitudes: In the night of 9 december I made several estimates of the Nova using many pairs of comparison stars near the same almucantarat and getting the same result within less than 0.1 magnitude! Obviously for the observations the higher is the star the better is the estimate, and it happens around 5am of local time, which reduces the influence of atmospheric extinction. Summarizing: with the Nova so bright do not be afraid to use unaided eye and take advantage of Stellarium to recover and archive name, altitude and magnitude of comparison stars near the same altitude circle. When entering new observations you can add in the comments "same altitude circle comparison stars", or quoting the arabic word... more exotic! The nova is still too bright for APASS to obtain reliable photometry, at least in normal passbands. I thought that you might like to see the difference in the nova field between the Johnson B passband (400nm) and the Y passband (1000nm). Here is an 800x800 cutout of the field from last night, with a 2-second exposure for B (saturated on the nova) and a 20-second exposure for Y. Enjoy! Please notice the prominent P-Cygni profile in the Dec 5 spectrum, indicating an expansion speed in the range of 900 km/s. On the other hand, the Dec 9 spectrum shows a much stronger emission in H-Alpha (the same phenomenon happened with V339 Del a few days after the explosion). Spectra details available in the above link. Brightest peak of Nova Cen 2013 ongoing! Tonight it was supposed to be a Geminids' night but it was cloudy in BA most of the night. Fortunately at 3AM clouds parted and I could make some observations. I saw only a couple of faint Geminids but was able to look the other way and what a surprise it was to see the nova brighter than ever! It was at V= 3.3!! I made a second estimate when sunrise started and I made it at V= 3.27 at 07.26 UT and rising. Finally the clouds parted in Canberra and I was able to do some photometry. A rapid drop: at 16 Dec 16:40 UT it was V=4.715, B=4.90. I also took a low resolution spectrum with the SA 100. Ha lines continue to increase and FeII lines strong. I note that Nova Del did the same at the same point in its evolution. I wonder what is happening spectrally? What's this nova doing? First observation in six days and it was back up to about 45 even 44 on Dec 23.500. Definitely brighter than 47. I just made a visual estimate of 4.3 and wrote a blog post with a light curve update. The AAVSO home page references the above article published by www.universetoday.com/. The article talks about an image from Rolf Wahl Olsen in which the nova appears pink. The image is a LRGB and I suspect shows more than a little false color. After all, black and white pretty pictures don't sell all that well. But it is the explanation that really leaves me scratching my head. It would seem that color should be a function of tempature rather than chemical composition. I would expect that there should be multiple hydrogen lines present but not a basic shift in color. On checking the AAVSO light curve and this forum, it appears that most observers are reporting a B-V of between 0.0 and 0.6. A little on the blue side to neutral. My understanding is that we are not actually seeing the photosphere of the star itself. The ionised ejecta from the nova are optically thick at this point. We are only seeing the expanding gas cloud - mostly ionised hydrogen, of course, but a significant component of doubly-ionised iron. The attached low-resolution spectrum from 26 December gives you some sense of the relative intensity of the Ha and Hb emissions relative to the underlying continuum. B-V started at about 0.5 when the nova was at maximum. This dropped to around 0 by about 18/12 as the Hb lines really started to take off. Then B-V has increased a little to its current level of around 0.15, my guess is as the FeII lines around 5100 A have made more of a contribution to V.
Traditional assumptions around B-V don't hold up for an object like this. Look at the obs for 18/12 taken by Arne. B-V is close to zero, indicating a pretty blue star (this is the Hb). But V-R is 0.7! Most unusual, to say the least, for a colour index based on temperature. But explicable through the intensity of the hydrogen emission lines. It is at V= 4.8 on December 30, 06.32 UT. I notice another bounce in brightness is being displayed in the AAVSO light curve (4 Jan 2014). I'm seeing lots of reports of magnitudes to 4.3 and even to 4.1 on popular forums and I wonder if the Purkinje effect is coming into play. I was just outside and tested it using binoculars. Staring at the nova and close bright comp stars it could seem as bright as 4.3, maybe brighter. Using the recommended quick glance method it was dimmer, around 4.7-4.8. The best measure I could get was by placing the nova and the 4.3 & 4.8 comp stars in the same binocular field and quickly glancing at the centre of the field, all the bright stars being in peripheral (averted) vision. It was consistently close to the 4.8 star in brightness, maybe a slight touch brighter (4.7). While the trends of the light curve have been clear, there is still a scatter of about 0.5 mag or more in visual estimates. What's more is that there is no clear denser line of 'favoured' observations, just a 0.5 mag scatter. No doubt airmass differences could be a contributor but the nova is reaching reasonable altitudes in late evening in the south and is quite high for morning observations.